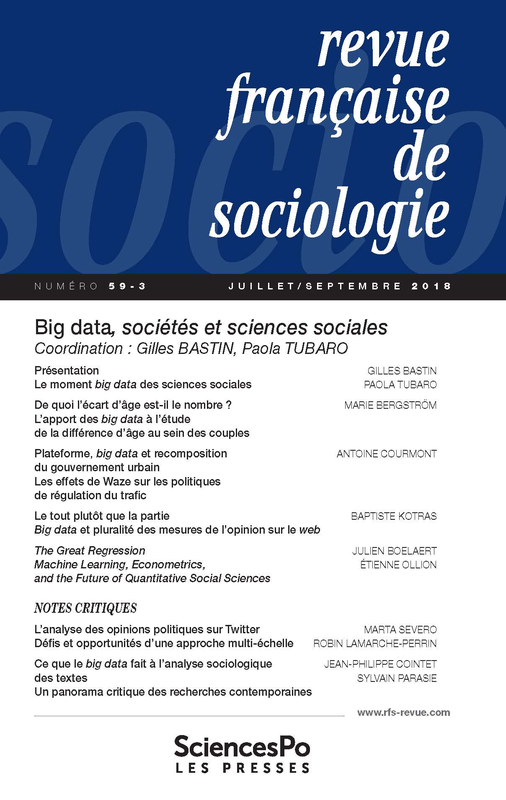 Just published: Big data, societies and social sciences, a special issue of Revue Française de Sociologie, guest-edited by Gilles Bastin and myself. Read a pre-print of our Introduction here. English versions will be available soon. I’m excited to report that earlier this month, I ran the second wave of data collection for our Sharing Networks research project at OuiShare Fest 2017! 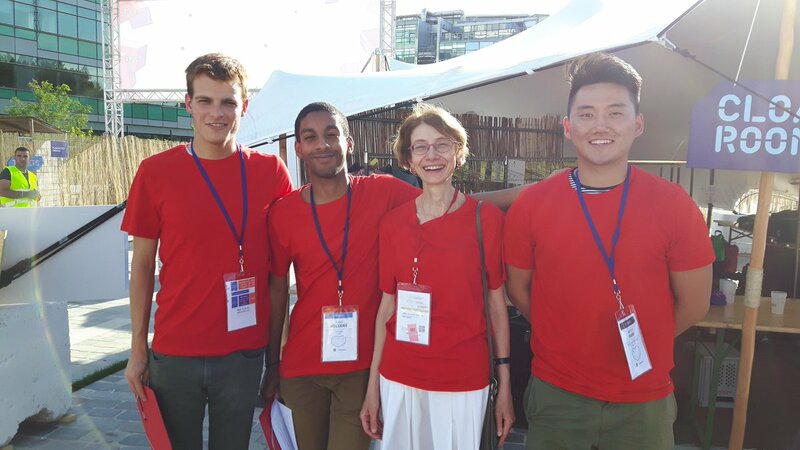 To understand how people form and reinforce face-to-face network ties at such an event, I fielded a questionnaire with the help of a committed and effective team of co-researchers. It is a “name generator” asking respondents to name those they knew before the OuiShare Fest, and met again there (“old frields”); and those they met during the event for the first time (“new contacts”). Participants then have to choose those among their “old” and “new” contacts, that they would like to contact again in future for joint projects or collaborations. Interestingly, my good old pen-and-paper questionnaire still gives a lot of insight that digital data from social media cannot provide – just like a highly computer literate community such as this feels the need to meet physically in one place every year for a few days. Like trade fairs that flourish even more in the internet era, the OuiShare Fest gathers more participants at each edition. They meet in person there, which is why they are to be invited to respond in person too. One part of the Sharing Networks 2017 onsite survey team. 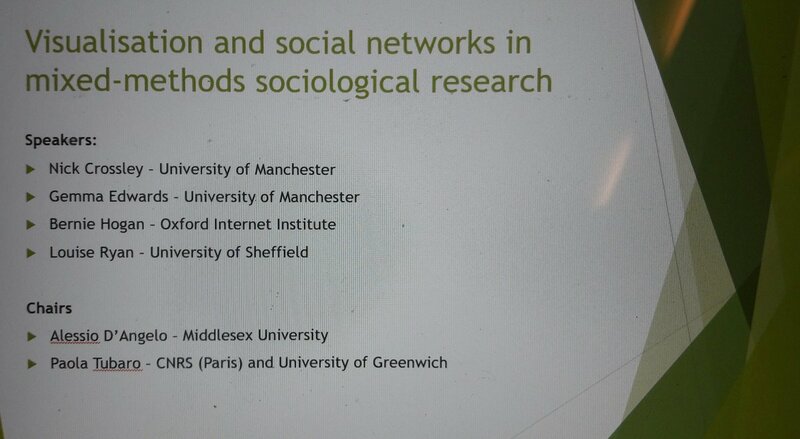 This morning, we had a plenary on “Visualisation and social networks in mixed-methods sociological research” at the British Sociological Association conference now going on in Manchester. This session, organized by the BSA study group on social networks that I convene with Alessio D’Angelo (BSA SNAG), builds on a special section of Sociological Research Online that we edited in 2016. Alessio and I chaired and had four top-flying speakers: Nick Crossley, Gemma Edwards (both at the University of Manchester), Bernie Hogan (Oxford Internet Institute) and Louise Ryan (University of Sheffield). Each speaker briefly presented a case study that involved visualization, and all were great in conveying exciting albeit complex ideas in a short time span. What follows is a short summary of the main insight (as I saw it). 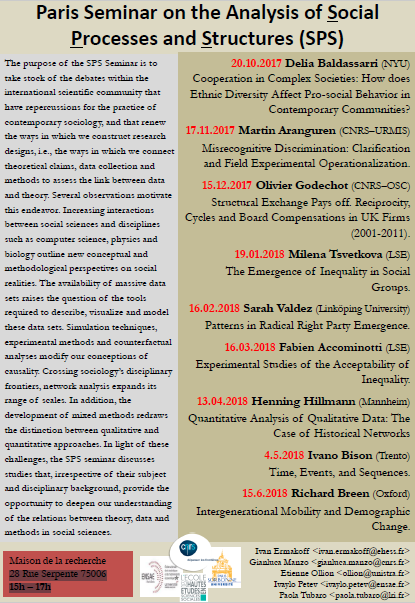 Together with colleagues Gianluca Manzo, Etienne Ollion, Ivan Ermakoff, and Ivaylo Petev, I organize a new inter-institutional seminar series in sociology. This new Social Processes and Structures (SPS) Seminar aims to take stock of the debates within the international scientific community that have repercussions for the practice of contemporary sociology, and that renew the ways in which we construct research designs, i.e., the ways in which we connect theoretical claims, data collection and methods to assess the link between data and theory. Several observations motivate this endeavor. Increasing interactions between social sciences and disciplines such as computer science, physics and biology outline new conceptual and methodological perspectives on social realities. The availability of massive data sets raises the question of the tools required to describe, visualize and model these data sets. Simulation techniques, experimental methods and counterfactual analyses modify our conceptions of causality. 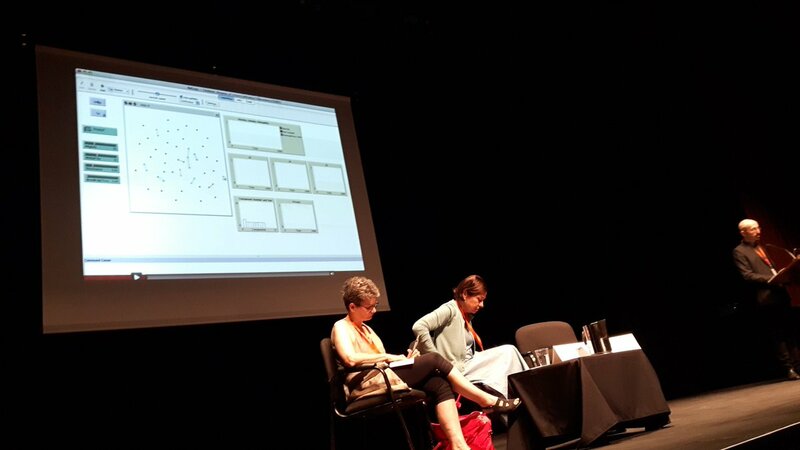 Crossing sociology’s disciplinary frontiers, network analysis expands its range of scales. In addition, the development of mixed methods redraws the distinction between qualitative and quantitative approaches. In light of these challenges, the SPS seminar discusses studies that, no matter their subject and disciplinary background, provide the opportunity to deepen our understanding of the relations between theory, data and methods in social sciences. The inaugural session took place on 20 November 2016; the “regular” series starts this Friday, 27 January, and will continue until June, with one meeting per month. 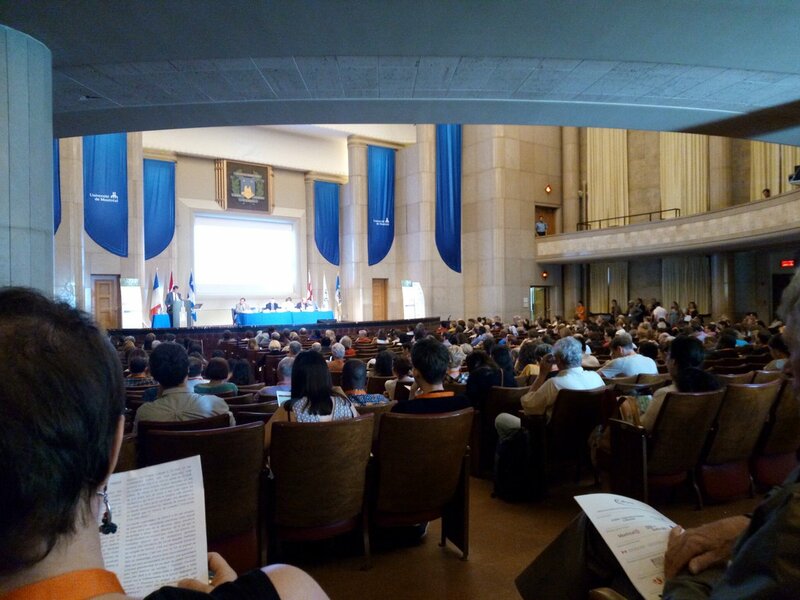 All sessions take place at Maison de la Recherche, 28 rue Serpente, 75006 Paris, room D040, 5pm-7pm. All interested students and scholars are welcome, and there is no need to register in advance. Revue Française de Sociologie invites article proposals for a special issue on “Big Data, Societies and Social Sciences”, edited by Gilles Bastin (PACTE, Sciences Po Grenoble) and myself. Focus is on two inextricably interwoven questions: how do big data transform society? How do big data affect social science practices? Substantive as well as epistemological / methodological contributions are welcome. We are particularly interested in proposals that examine the social effects and/or the scientific implications of big data based on first-hand experience in the field. The deadline for submission of extended abstracts is 28 February 2017; for full contributions, it is 15 September 2017. Revue Française de Sociologie accepts articles in French or English. Further details and guidelines for submission are in the call for papers. 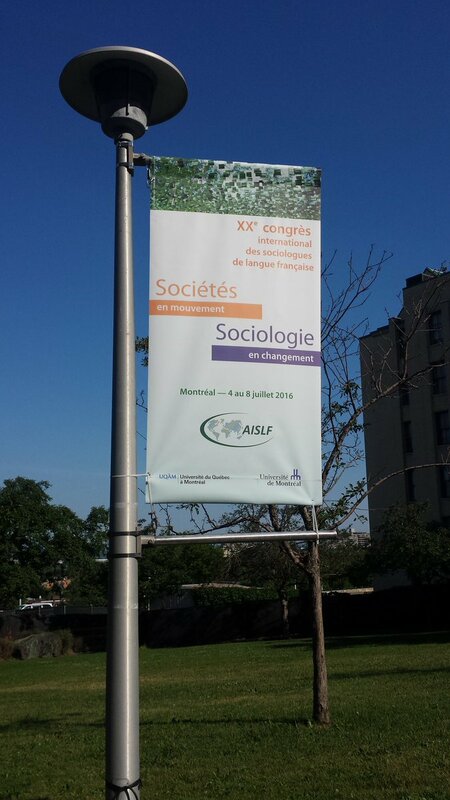 Just attended the 20th conference of AISLF, the international association of French-speaking sociologists, in Montréal. Back home yesterday I found a state of fear and madness (again, alas…). But before that, I enjoyed a nice time with fellow researchers from France and (perhaps even more intriguingly, or simply more newly) from the different countries in which French is spoken, ranging from Canada, Belgium and Switzerland to several African countries. It was a good opportunity to get a sense of what research is done around us. Lots of good presentations. Interestingly, digital sociology appears to be on the up, as many researchers investigated topics that had to do with digital technologies, their usages, and the ensuing economic and social transformations. That there was no dedicated stream is not in itself a problem: if digital technologies permeate all our lives, they should not be studied in a separate subfield but as part of the sociology of work, of gender, of education etc. (On this particular point, I am proud to say I was interviewed, with Antonio Casilli, by ICI – Radio Canada, and our contribution was featured by the French Consulate in Québec, a supporter of the event). The other good thing is the emergence of social networks research in two keynote presentations – by Antonio A. Casilli and Michel Grossetti – which is far from a small achievement, considering that the association does not have a dedicated social networks research group (I would love to see one being created sooner or later… like BSA-SNAG, the group I convene for British Sociological Association).